Since you have trackbacks disabled...consider this tyour trackback! Oh, goody! I cannot wait. What wonderful news, Floyd. I'll be back to read more later. Congratulations on the arrival of your new book! Now you are a published author! The books look absolutely beautiful. Have a great time promoting and selling them. It may make an interesting change in your lifestyle. the harvest's come home, man! my sincerest, warmest CONGRATULATIONS. lovely job. Can I pick up a copy on Sunday, saving you the shipping? 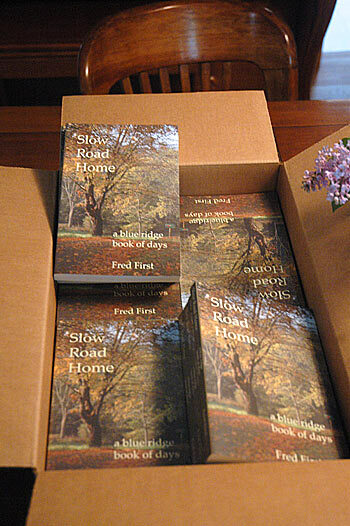 Having published a few stories myself in the past, I know exactly your feeling of opening a box and seeing the result of your labors. It IS an out-of-body experience! Can't wait to receive my copy. Congratulations, Fred. Fred, we are thrilled for you and look forward to holding this book in our hands! !